I remember when a week had 7 days in it. Good luck to Captain Littlehands! Competitors in Sperry Charleston Race Week 2018 were hurriedly carrying equipment, sail bags and other gear down to the docks while the various vendors were busily setting up shop. Event director Randy Draftz and other organizers with Charleston Ocean Racing Association were huddled in a conference room going over last-minute details while volunteers were working furiously to install the infrastructure that transforms the beach area into a thriving party venue. By mid-afternoon, a large contingent of boats was out on the water testing sails and tuning rigs. 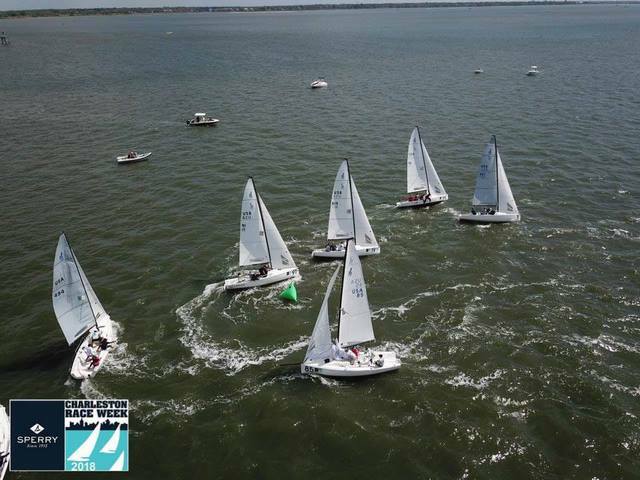 Most of the J/70 and Melges 24 fleets conducted a series of practice races mid Charleston Harbor. 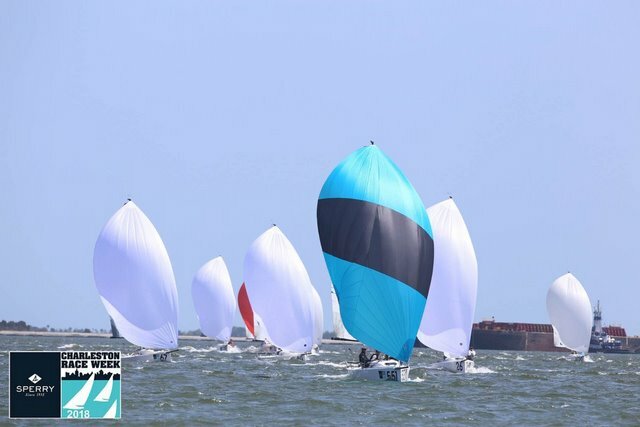 A significant number of VX One and Flying Tiger 7.5 entries filled the racing area in the Cooper River located closer to the Arthur Ravenel Bridge. Thursday was all about final preparations and practice in advance of Sperry Charleston Race Week 2018. It will be go time on Friday as 246 boats in 16 classes take to the waters off this historic coastal city during the 23rd edition of this renowned regatta. Quantum Sails professional Ed Baird conducted the first of many weather briefings in the tent area on Thursday morning and declared the forecast quite promising. Baird said competitors can expect a healthy sea breeze from the southeast on Friday and Saturday. Baird said Sunday could be a bit dicey as current forecasts call for a front to move through Charleston. However, there is optimism the conditions will improve in time to complete the three-day regatta in the afternoon. 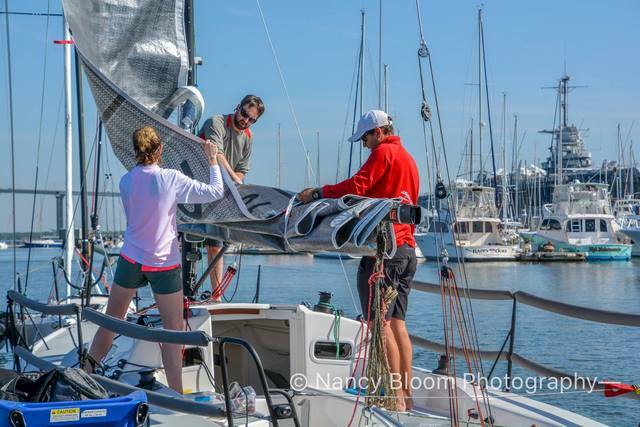 Overall principal race officer Hank Stuart and his highly competent team are confident they can give the sailors plenty of action by the time Sperry Charleston Race Week wraps up. 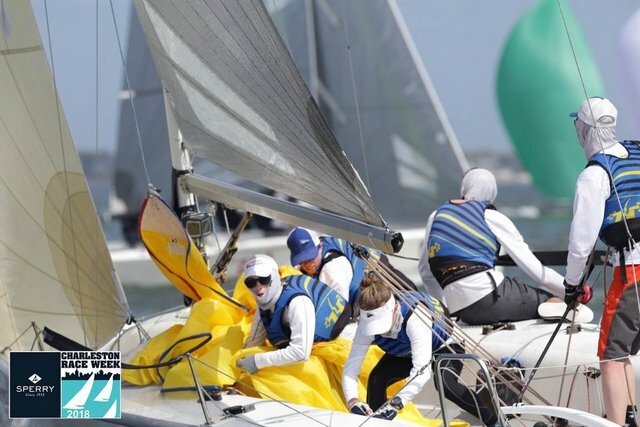 Racing will be conducted on six separate circles with 10 of the 11 one-design classes along with ORC C sailing courses inside Charleston Harbor. Meanwile, ORC A and B will be joined by the J/105 fleet on Circle 5 that is set on the Atlantic Ocean. A pair of Pursuit Race classes (Spinnaker and Non-Spinnaker) consisting of 35 boats will do one distance jaunt per day around a combination of government and drop marks. Principal race officer Ray Redniss is adding several new course configurations to spice up the Pursuit Race classes, which have become increasingly more popular. 2018 day2 sTaran Teague, PRO on Circle 5, issued updated Sailing Instructions for the offshore courses to accommodate racing back into Charleston Harbor to close out each day. Plans call for an ocean race with a harbor start on Sunday. ORC A features the fastest boat in the regatta – Spookie, a TP52 owned by Steve and Heidi Benjamin. That class also includes Teamwork, a J/122 skippered by Robin Team that has enjoyed considerable success at Charleston Race Week. Team, a resident of Lexington, N.C., is the only four-time winner of the prestigious Palmetto Trophy Palmetto that is presented to winner of the tightest class among handicap divisions. Rattle-n-Rum, a GP26 skippered by Mike Beasley of Annapolis, Md., is the defending Palmetto Cup champion. Beasley brings back basically the same crew and will try to repeat as winner of ORC C, which has increased to 13 boats this year. J/70 is again the largest class in the regatta with a whopping 69 entries, including the past two world champions. Joel Ronning captured the 2016 world title off San Francisco while Peter Duncan is the reigning champ after winning the 2017 worlds that were in Porto Cervo, Italy. There are numerous other top contenders in J/70 class, including 2018 Midwinter Championship winner Jack Franco of Kemah, Texas. Bill Hardesty and Allan Terhune, a pair of proven pros, are crewing for Franco on 3 Ball JT. VX One is the fastest growing class at Sperry Charleston Race Week, having almost doubled in size from 13 boats in 2017 to 25 this year. Class veteran John Potter will be seeking his third VX One victory at this regatta, having won in 2015 and 2017. “We’ve been working on building the class for quite a while now. 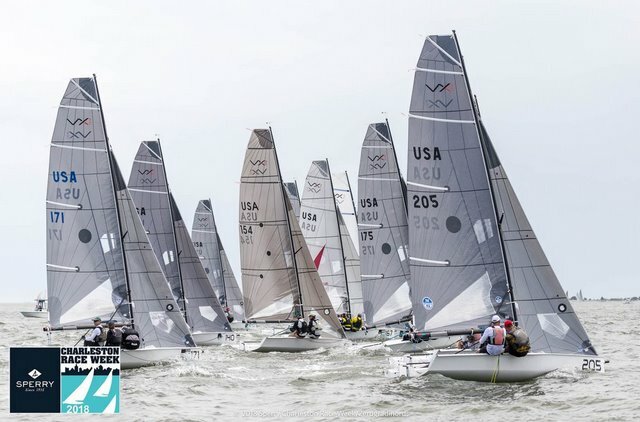 This is our fourth year coming to Charleston and word has spread that this is a great regatta to do,” said Potter, the 2016 VX One North American champion. 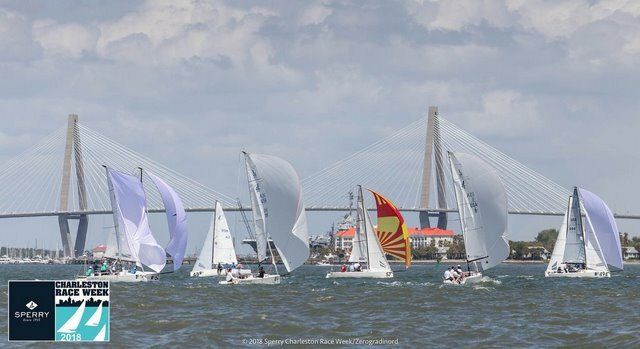 Will Van Cleef, a Charleston resident and industry professional, has been instrumental in increasing the VX One numbers at Sperry Charleston Race Week. Greg Fisher, Director of Sailing at College of Charleston, will be skippering an entry this year and figures to be among the top contenders. Potter, one of several past North American champs competing in Sperry Charleston Race Week 2018, will be racing with co-owner David Guggenheim and his 17-year-old daughter Emily, who is a senior in high school. Melges 24 is the second-largest class in the regatta with 31 boats and it includes a who’s who of class royalty. Brian Porter, the 2013 world champion, rattled off the names of numerous skippers that should contend. Monsoon, owned by Bruce Ayres of Newport Beach, Cal., was runner-up at the 2017 Melges 24 Worlds in Helsinki, Finland and recently captured a couple major regattas off Miami. Porter is looking forward to racing with his son RJ, a junior member of the College of Charleston sailing team. “We love this venue, which can be a little crazy at times. Things can go bad in a hurry with this current,” Porter said. J/24 skipper Tony Parker called it “champagne conditions” and it would be hard to argue with that assessment. 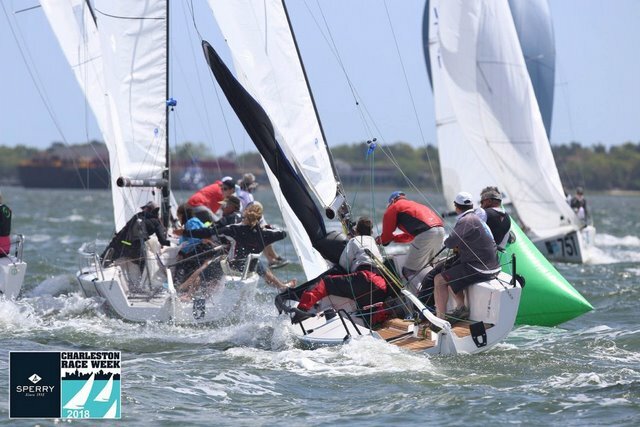 Mother Nature delivered in a big way on the first day of Sperry Charleston Race Week with action getting underway in strong winds, sunny skies and warm temperatures. 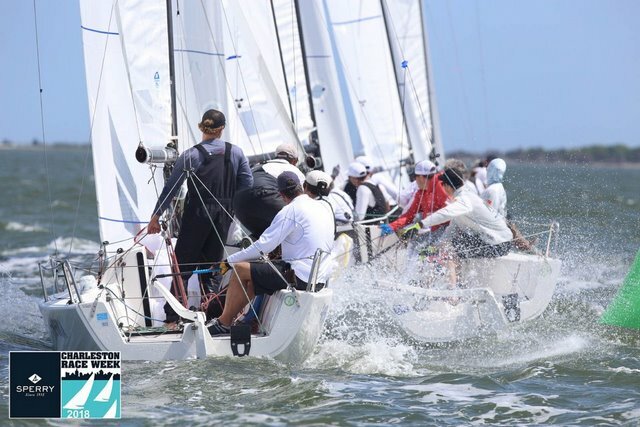 Ten of the 11 classes competing on the four inshore circles were able to complete four races in winds that ranged from 12 to 16 knots and swung from south to slightly southwest. The lone exception was the highly competitive J/70 class, which did three races at the request of the sailors. 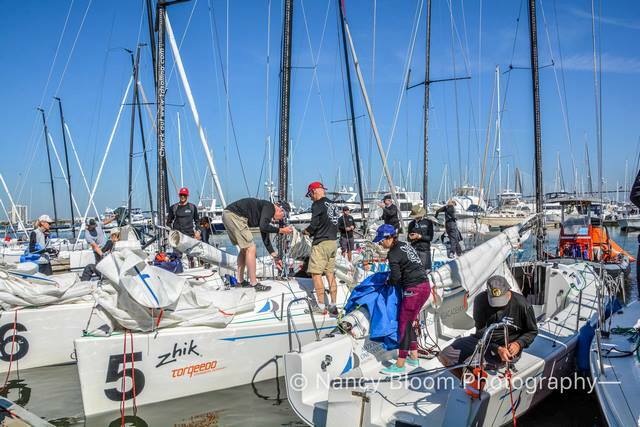 Because there are 66 boats in J/70, the class is so large that it is split for reseeding after each day of racing. Class organizers felt three races would make for better round-robin competition. Winds were lighter for the five classes racing on Circle 5 and Course 6 outside the jetties on the Atlantic. ORC A and B along with the J/105 one-design fleet all finished two races. Parker and his crew aboard Bangor Packet sandwiched a couple bullets inside a pair of seconds to close the day with a low score of six points - two better than runner-up Angel of Harlem (Robby Brown, St. Petersburg, FL). 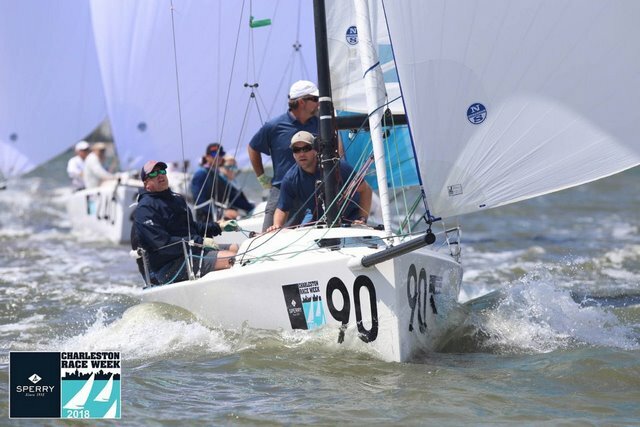 North Sails pro Will Bomar is calling tactics for Parker, who is coming off a tough season in which he was runner-up at the J/24 Worlds, East Coasts and Midwinters. James Niblock is trimming the headsails and Martha Parker (no relation) is working the bow on Bangor Packet. 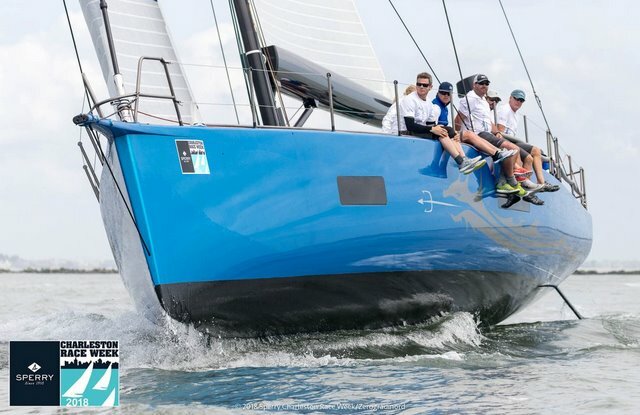 John Potter got off to a great start in his bid to repeat as VX One champion for Sperry Charleston Race Week, winning three of four races on the day. Co-owner David Guggenheim trimmed and handled tactics for Potter, who is thrilled to also have his 17-year-old daughter Emily aboard. Potter, a Savannah resident and Beaufort Yacht Club member, holds a three-point lead over Christopher Alexander and his team on Isabelita Con Queso. Alexander, who lives in Ocean Springs, Mississippi, won Race 2 and closed with consecutive seconds. “Chris did real well in heavy air considering his crew weight. I think he’s sailing about 80 pounds lighter than we are,” Potter said. Potter and Guggenheim, who are 61 and 60 years old, respectively, have been racing the VX One together for eight years and boast tremendous chemistry. They had no problem planing in winds that started around nine knots and gusted to 18 knots at times on Circle 1, which is set on the Cooper River in front of Carolina Yacht Club. Peter Duncan, arms full of Heinekens was all smiles as he walked along A Dock back to his boat, and rightfully so. Duncan and the Relative Obscurity team had a great day on the water with 2-1-1 score line to set the early pace in J/70 class. Tactician Victor Diaz de Leon made some great calls while Willem Van Waay was solid trimming the headsails as Relative Obscurity showed the form that produced a world championship last year off Porto Cervo, Italy. Duncan, a resident of Rye, N.Y., is making his debut at Sperry Charleston Race Week. It only took one day to sell him on the venue. “Absolutely beautiful! What a great place to go sailboat racing. Today was a real treat,” said Duncan, who holds a six-point lead on Bruce Golison (Long Beach, CA) and his crew on Midlife Crisis. No boat did better on Day 1 than Terminally Pretty, the Viper 640 sailed by the husband-wife team of Geoff and Mary Ewenson. Geoff Ewenson steered as the Annapolis team posted four bullets. Mary Ewenson, who is publisher of the Chesapeake Bay sailing magazine SpinSheet, is the jib trimmer. Ewenson noted how the tide changed from ebb to flood just prior to the final race. Monsoon has been on a roll of late, winning the St. Petersburg NOOD in February and Bacardi Cup in March. The Newport Beach, California boat finished ninth in Race 1, but rebounded to go 2-4-1 in the last three starts. George Collins hasn’t raced his Tripp 62 named Chessie Racing in five months because it has been undergoing repairs at Thunderbolt Marine in Savannah. Regular crew member Jeff Gentzen lives in Charleston and suggested Collins bring the boat here from Georgia to participate in the Pursuit Racing portion of the regatta. Former America’s Cup sailor Mike Toppa provided tactical advice as Collins steered Chessie Racing to victory in Friday’s race. As largest and fastest entry among 19 boats in the Spinnaker division, the Tripp 62 started last. Collins was happy to have a Charleston Harbor pilot aboard as Crayton Walters knows the passage into the Atlantic Ocean intimately and could tell Toppa where the boat could and couldn’t go. 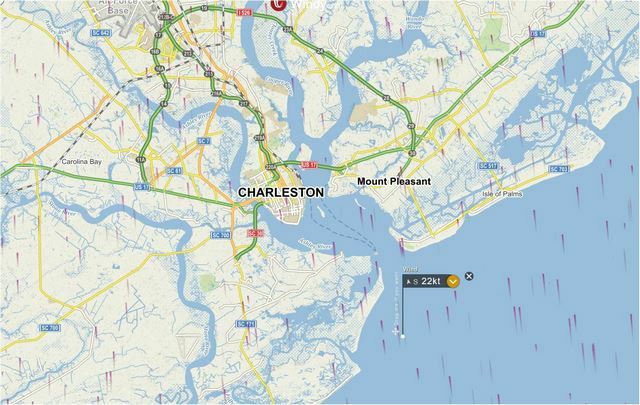 Winds on the ocean picked up to about 10 knots as the day wore on and Chessie Racing made good speed on the way back toward Charleston Harbor, overtaking the 1D35 Warhorse (Ed Norton, Charleston) just prior to reaching the channel marker. Collins calls all his boats Chessie Racing in honor of the Annapolis-based syndicate he funded to compete in the 1997-98 Whitbread Round the World Race. 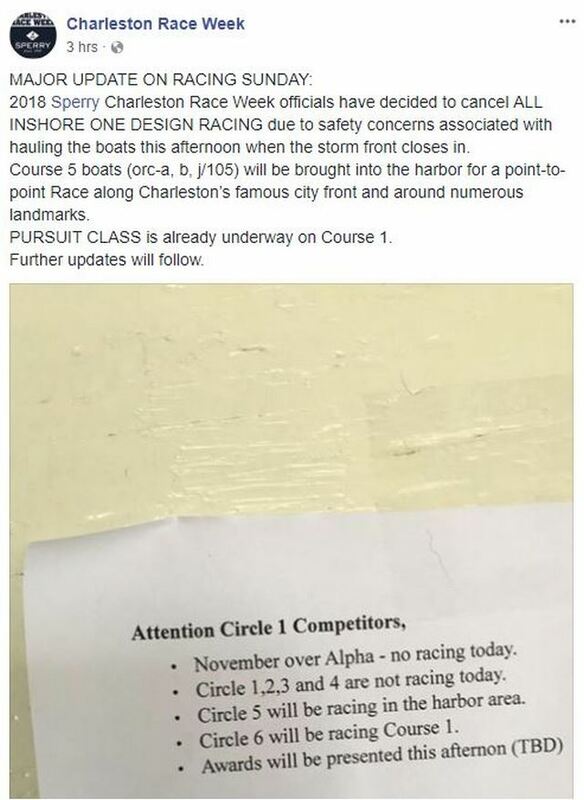 Racing on Circle 5 was postponed for 2 ½ hours to allow the sea breeze to build. Race 1 got underway around 1 p.m. with 2016 Rolex Yachtsman of the Year Steve Benjamin leading the TP52 Spookie to victory in both races for ORC A.
Benjamin, who is a finalist for the Seahorse Magazine Sailor of the Month honor, has Michael Menninger aboard as tactician and Artie Means as navigator. 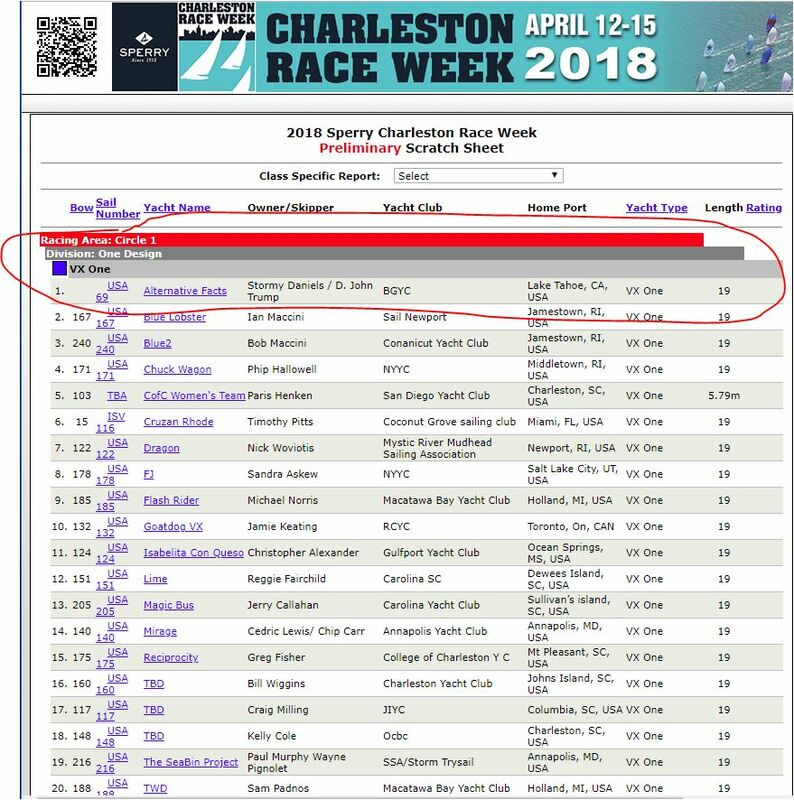 Concern about what Sunday might bring made Saturday all the more important at Sperry Charleston Race Week 2018. Forecasts call for a front to move through town and there is no way to predict how much racing will be completed on the final day. As the skies darkened over Charleston Harbor on Saturday evening, the leaders had to feel good about their position while the followers were hoping for an opportunity to change the final standings. “We’re still in the hunt. Hopefully, we’ll get two or three more races tomorrow and be able to improve our position,” said Savasana skipper Brian Keane, who holds fourth place in J/70 class. 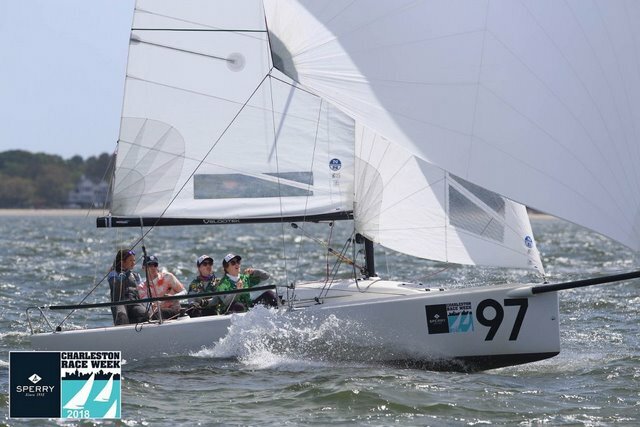 Plans had called for the J/70 fleet to conduct three races per day, but the prospect of thunderstorms on Sunday prompted the class leadership to ask regatta organizers to run four on Saturday while the weather was clear and the wind was blowing between 8 and 15 knots. Peter Duncan and his crew on Relative Obscurity had another solid day on the water and were able to maintain their lead. Relative Obscurity finished 10th in Race 4, but came back with results of 1-3-4 and has a low score of 22 points. John Brim and the Rimette team are seven points behind Duncan and two points ahead of Joel Ronning and the Catapult crew. A strong ebb tide pushed a bunch of boats over the start line and caused two general recalls for J/70 class, largest of the regatta with 68 boats. 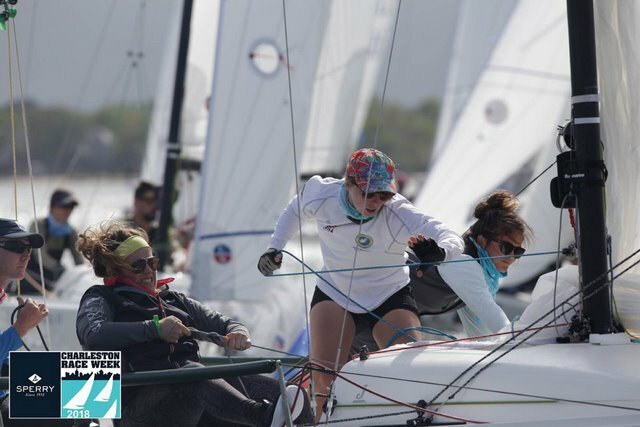 It took a while to finish four races as a result and the fleet did not return to the docks at Charleston Harbor Resort and Marina until 5 p.m.
To complicate matters, the tide changed from ebb to flood late in the afternoon. Keane sailed Savasana to victory in Race 6 after posting a third in Race 5. Those results came between a seventh and a 10th and left Massachusetts entry with 34 points, just five out of second place. Thomas Barrows and Joe Morris, who represented the United States in 49er class at the 2016 Summer Olympics, are aboard Savasana as tactician and jib trimmer, respectively. Veteran bowman Ron Weed rounds out the team. Skipper Bruce Golison had Midlife Crisis in second place after taking second in the opening race on Saturday. The Long Beach resident had an impressive 1-7-2-2 score line at that point. Double digit results in the other three races on Saturday dropped Golison to 10th overall. Golison enjoyed considerable success in the J/24 and Etchells classes before buying a J/70 three years ago. The 61-year-old loves racing a sportboat and competing against some of the finest sailors in the world. Further down A Dock, Rattle-n-Rum skipper Mike Beasley was quite happy to hold a five-point lead in ORC C class. The Annapolis resident has steered his GP 26 to victory in three races and placed no worse than fourth in the other four. Ruttle-n-Rum is trying to repeat as winner of the prestigious Palmetto Trophy that goes to the top performing boat among the handicap classes and could do so considering the caliber of competition among the 12 boats in ORC C.
UltraViolet, an Antrim 27 owned by Dave Prucnal of Pasadena, Maryland, has given Beasley’s boat all it can handle and is well within striking distance if multiple races are held Sunday. Brian Porter and the Full Throttle team continue to set a strong pace in Melges 24 class, second-largest of the regatta with 31 entries. Porter opened with a sixth on Saturday, but then reeled off a 3-2-1 score line and sits at 11 points – 13 better than Monsoon skipper Bruce Ayres. Mike Goldfarb, a relative newcomer to the Melges 24 class, is just one point behind Monsoon in third place. Goldfarb, who bought his boat in 2016, finished strong on Saturday – winning Race 7 in between a pair of seconds. It’s a similar story in VX One where John Potter and David Guggenheim have won five of eight races. Those two class veterans showed a slight chink in the armor with a 10th in Race 8, but can throw out that result and stay five points clear of Christopher Alexander. Reciprocity held third place in the 25-boat class despite having to make a major crew change. Helmsman Greg Fisher was sidelined by a bum shoulder and replaced by Craig Leweck, publisher of the sailing newsletter Scuttlebutt. “Craig jumped right in and did an awesome job of steering a boat he’s never sailed before,” said Jeff Eiber, who works the middle aboard Reciprocity. Leweck is staying at the home of Greg and Jo Ann Fisher and knew something was up when he came downstairs and was asked what he planned to do for the day. “I walked into the kitchen and couldn’t even get a cup of coffee before being hit with a series of inquisitive questions such as what was my waist and shoe size,” Leweck said with a laugh. “Jeff and Jo Ann were trying to figure out if I could fit into Greg’s gear.” Leweck acquitted himself well in the substitute role, steering reciprocity to victory in Race 7. There are 11 boats in J/22 class and seven are being sailed by Warrior Sailing teams. Skipper Scott Ford is skippering the lone Warrior entry that is racing with a spinnaker and doing extremely well. Ford is trimming the mainsail, Sammy Lugo is trimming the jib and Josh Agripino is driving USA 1367, which won Race 3 and has taken third in five other starts. Agripino served in the Marine Corps and sustained severe injuries to his lower legs and feet while also losing sight in one eye. Lugo, who worked in civil affairs for the Army, had his right leg amputated just below the knee. J/22 class grew from three boats last year to 11 this year due to the strong participation of members from the Warrior Sailing program along with the generosity of the College of Charleston, which donated all the boats. Ford was pleased that several of the Warrior teams are learning how to fly a spinnaker and hope to do so at Charleston Race Week 2019. Velocidad took over the lead in J/24 class as skipper Chris Stone got the gun in two of three races held on Saturday. The New Jersey entry is winning by tiebreaker of Angel of Harlem (Robby Brown, St. Petersburg, FL) as Day 1 leader Bangor Packet (Tony Parker, Washington, D.C.) dropped to third. There is good action in J/88 class where Tim Finkle has skippered Seaweed to the top of the standings on the strength of four bullets. Tactician Kris Werner, owner of the Quantum Sails loft in Rochester, helped Werner close out Saturday with back-to-back wins to gain eight points of separation from Deviation (Iris Vogel, New Rochelle, NY) and Spaceman Spiff (Rob Ruhlman, Cleveland, OH). 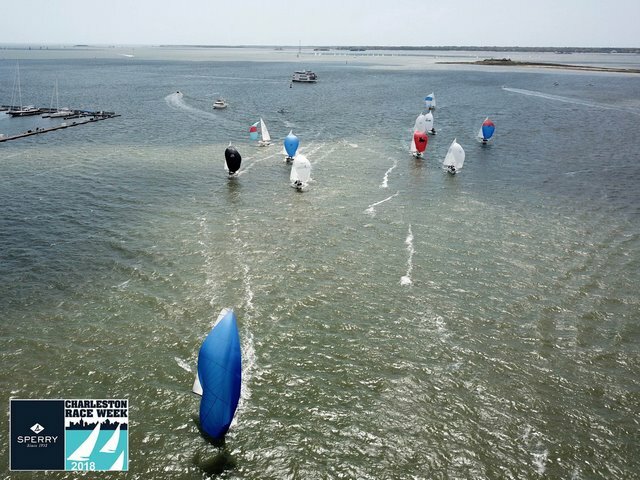 Taran Teague, principal race officer on Circle 5, followed a windward-leeward race with an 11-nautical mile distance race that finished in Charleston Harbor. Mount Pleasant local Robert Scribner has now steered Joyride to victory in all four races held over two days and has a comfortable 10-point lead in J/105 class. 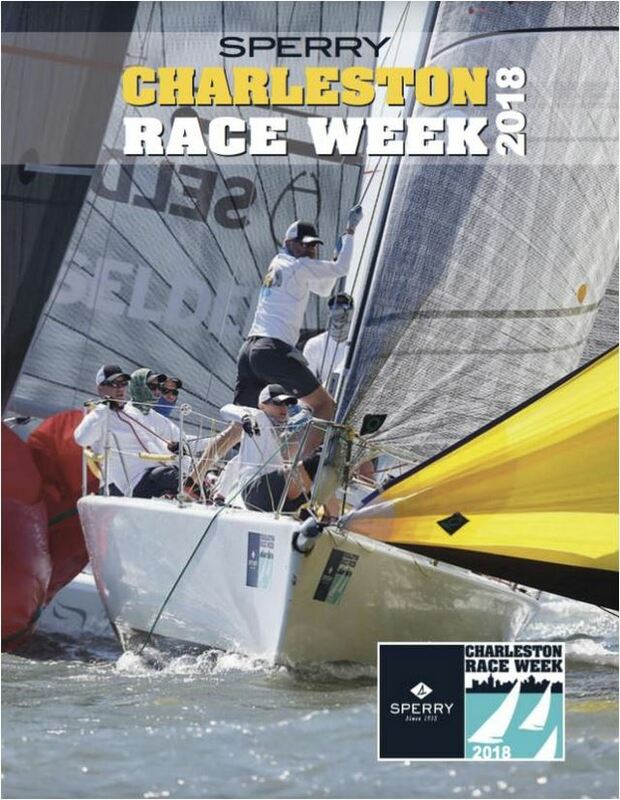 Scribner made his Charleston Race Week debut last year and finished fourth out of five boats in J/105. The 72-year-old skipper was determined to do better this year and took steps to make that happen. Photon, a 1D35 being skippered this weekend by David O’Reilly on behalf of owner Robert Hibdon, is leading ORC B based off winning all three windward-leeward races. Photon finished third in the distance race behind the J/35 Arrow (Willy Schwenzfeier) and the J/36 Soul (College of Charleston), but still leads the class by five points. 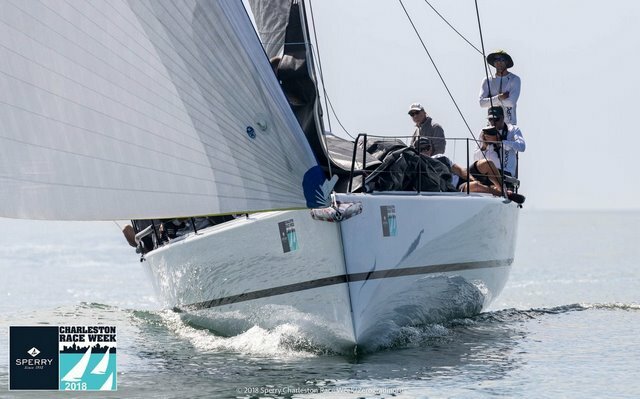 Spookie, the TP52 skippered by former Rolex Yachtsman of the Year Steve Benjamin, leads ORC A by two points over the XP 44 Sitella (Ian Hill, Chesapeake, VA). 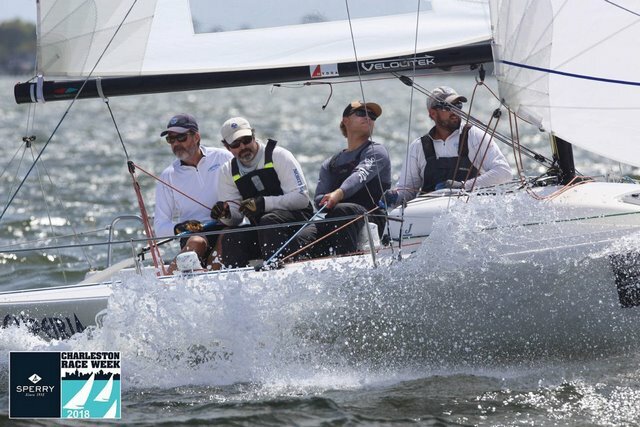 Teamwork, the highly-successful J/122 owned by four-time Palmetto Cup winner Robin Team, had its moment in the sun on Saturday by winning the distance race. George Collins led the Tripp 62 Chessie Racing to victory for the second straight day in the Spinnaker Pursuit Race while John Barnes and Will Cramer lead the Non-Spinnaker Pursuit Rce class after posting a pair of seconds aboard their e-33 named Easterly. I wish my work week was 2 days!